Which funds are best for investors? Exchange-traded funds (ETFs) have a lot of advantages over older securities like mutual funds. For instance, mutual funds declare “distributions” each year. Your taxable accounts must pay taxes on these declared amounts, even if you never sold a single share. ETFs are legally structured so taxable distributions are almost never a problem. But which ETFs should individual investors actually buy? For more information, see Newsletter #9. A real-money account that followed the Mama Bear Portfolio was tracked during calendar year 2016 by the brokerage firm FolioInvesting.com. The Mama Bear outperformed the S&P 500 (including dividends) for 10 out of 12 months of the year. Significantly, when the S&P 500 fell a gut-wrenching 11% in January–February 2016, the Mama Bear Portfolio lost only a very mild 3% (image, left above). This head start — a smooth ride that’s typical of Muscular Portfolios — helped the Mama Bear perform well, even though diversified portfolios don’t usually win in bull markets. For more information, see Newsletter #8. For more information, see Newsletter #7. The June 23, 2016, vote in Great Britain to leave the European Union shook the world. The following Friday and Monday saw the value of global equities driven down by $3 trillion — the worst two-day rout ever, exceeding even the losses after the 2008 Lehman Brothers bankruptcy. The S&P 500 dived 5.3% on those two volatile days. But both the Mama Bear and Papa Bear actually rose, thanks to their fully disclosed strategy rules. The portfolios had rotated into bonds, precious metals, and commodities weeks or months before the shock wave struck. As a result, both portfolios were up 2.6% in two days as their assets rose, sparing investors from the agony that gripped most stock-market players. For the first six months of 2016, the Mama and Papa were up 10.5% and 6.3%, respectively, while the S&P 500 including dividends was up only 4.1%. The two Muscular Portfolios also suffered only minor drawdowns in early 2016 — the Mama declined only 2.3%, for example — despite the S&P 500 subjecting investors to a gut-wrenching 10.3% dive in its January-February collapse. For more details, see Newsletter #6. A new, fully disclosed investing strategy is joining the Mama Bear Portfolio, which was first revealed over one year ago. The new formula is called the Papa Bear Portfolio. 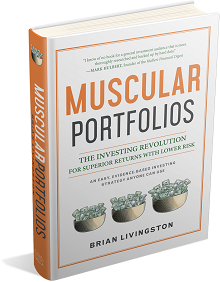 Both strategies will be part of the forthcoming book Muscular Portfolios: Reduce Your Risk to Increase Your Investing Gains (2018) by Brian Livingston. The Papa Bear Portfolio is an easy-to-use plan in which the investor holds three low-cost exchange-traded funds each month out of a menu of 13 ETFs. The selected three funds are those with the strongest performance, as determined by a Momentum Rule. Like the Mama Bear, the Papa Bear remains 100% invested at all times, with no market timing, no active investing, and no requirement for the investor to form any opinion about the market. The new Papa Bear Portfolio page displays ETF rankings that are updated every 10 minutes during market hours. For more information, read Newsletter #5. A Web page that reveals one of the model portfolios in the forthcoming book Muscular Portfolios (2018) is now available on this site. The service is free of charge. The page shows percentage allocations for the nine exchange-traded funds (ETFs) in the Mama Bear Portfolio, one of three investing models in the book. The statistics are updated every 10 minutes during New York market hours, with a delay of 20 minutes or more during active trading. The complete strategy rules for the portfolio are shown on the page. Statistics pages for the other model portfolios in the book will be added later in 2016. This project is an integral part of MuscularPortfolios.com, a disruptive technology that aims to drive the price of investing advice to zero. Individual investors, of course, may still need to hire experts on financial planning, wills, trusts, college savings, and other specialized topics — but basic portfolio design is now available for free. To use the information, see the Mama Bear statistics page.